Shoulder of lamb is full of flavour. For a special meal, serve with a fruity red wine gravy and seasonal cranberry and rosemary stuffing. Preheat the oven to 180°C, gas mark 4. Make small pockets in the skin of the lamb with the tip of a sharp knife and insert the slices of garlic. Place the lamb in a roasting tin and scatter with half of the rosemary. Roast for 1-1½ hours until cooked through (allow 25-30 minutes per 500g, plus 25-30 minutes) and the juices run clear when the joint is pierced with the tip of a knife. While the lamb is cooking, make the stuffing. Heat the oil in a frying pan and add the onion and crushed garlic. Fry for 2-3 minutes until softened. Add the cranberries and cook for 2 minutes. Remove from the heat and stir in the remaining rosemary, the breadcrumbs and the egg. Season with cracked black pepper and mix well. Place in a lightly greased shallow, ovenproof dish and bake for 20 minutes before the lamb is due to be ready, and until golden brown and piping hot. When done transfer the lamb to a board, cover with kitchen foil and leave to rest in a warm place. Skim off and discard any excess fat from the roasting tin. Place the tin on the hob over a medium heat and add the wine. Stir well, scraping up any sediment from the bottom of the pan. Stir in the redcurrant jelly and simmer for 2-3 minutes. 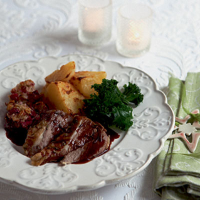 Carve and serve the lamb with the red wine sauce, pieces of stuffing, roast potatoes and curly kale. Dried cranberries, can be used in place of fresh in this recipe. If you have leftover bread, you could use this for breadcrumbs, rather than the ciabatta. A fruity Rioja would be ideal with the tender lamb and also to match the red berry flavours in the stuffing.